As we went down the road today something caught my eye high in the hedge. The hedge just here is a fairly robust hawthorn. On the other side of it is our field with the cattle in, so it does need to be robust. Cattle just don’t appreciate their own mass. They could easily knock you over and trampled you to death – and for once I’m not exaggerating – it happens, but I don’t think they do it with any malicious intent. In their interactions with each other, they quite normally use their shoulders or buttocks to lever each other aside and if a human is accepted as a part of their world then they can’t understand that a swift, friendly (lethal) thwack with the buttocks should be taken as anything other than a mark of comradeship. But back to the hedge and to the glimmer of blue that caught my eye. I had to stand on tiptoe and hold the camera as high as I could above my head to take the picture. Luckily the camera has a view screen that you can tilt, so it is possible to do this and check that you do have something in the field of view. 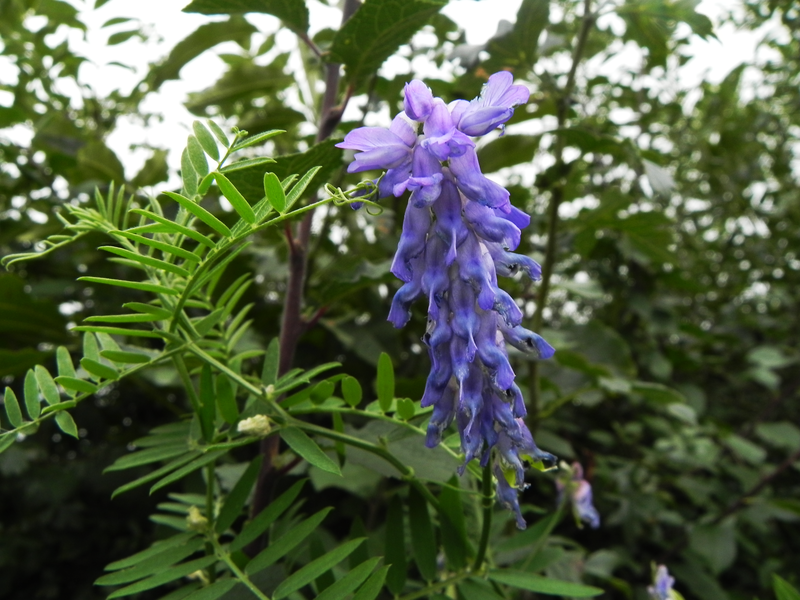 And what did we have – a blue spike of Bush Vetch. Bush Vetch that we associate with a knee high tangle of green and blue. Now, I had always assumed that it was called Bush Vetch because it was a small bush. Could it be that its name derives from its habit of climbing up into any bush it finds? I didn’t know that about cows. That’s a bit scary. I liked your blue flower. I’ve never seen a bush vetch before. Thanks for sharing. Hi Brenda – The farms around here are mostly small and the farmers tend to only keep a dozen or so cattle in each field. To make them more tractable and used to people, they feed them extra vitamins etc. every day or so – the downside of this is that if they see a human they immediately assume they are there to feed them so they all rush over to greet you. Even though you know they are almost all good natured – it’s still quite daunting to have a dozen beasts, each weighing a ton or so, suddenly vying to be your very best friend. We prefer to have a wall or a gate between us! Glad you liked the Bush Vetch – by the way, did you like my fairy story about the mushroom? I do have some more pictures of that large red mushroom – I could send you one if you wanted to do your own story. Sorry, I’m not at home at the moment – but I could send it on Tuesday. It seems a shame for such a good mushroom to only have one short sharp story – 400 words – I couldn’t get it shorter and I like to keep my posts under 300. You don’t mind longer posts, do you, so you could do it more justice I’m sure.